There are lots of good reasons to ask students for multiple representations of relationships. But I worry that a consistent regiment of turning tables into equations into graphs and back and forth can conceal the fact that each one of these representations were invented for a purpose. Graphs serve a purpose that tables do not. And the equation serves a purpose that stymies the graph. By asking for all three representations time after time, my students may have gained a certain conceptual fluency promised us by researchers like Brenner et al. But I’m not sure that knowledge was ever effectively conditionalized. I’m not sure those students knew when they could pick up one of those representations and leave the others on the table, except when the problem told them. Otherwise, it’s possible they thought each problem required each of them. The same goes for representations of one-dimensional data. We can take the same set of numbers and represent its mean, median, minimum, maximum, deviation, bar graph, column graph, histogram, pie chart, etc. So here is the exercise. Take one representation. Now take another. Why did we invent that other representation? Now how do you put your students in a place to experience the limitations of the first representation such that the other one seems necessary, like aspirin to a headache? Ok. First is bar chart, second is box plot. All situations in statistics require some data, and the best data is that which students compile themselves. For this comparison a single set of data is best presented as a bar chart, but compare the data from five or more distinct groups of subjects, same measure, and the multiple strip bar chat is a bloody mess. Five box plots above the same numberline, and so much more is revealed, at a small cost of loss of detail. I used to think that box plots were a waste of time until I saw the above usage. The same is true of physical representations. I am thinking of many algebra growth problems that involve squares and growing patterns. It is valuable to ask students to go through the actions of adding squares to watch a pattern grow through the addition of tiles. This action can help them have the physical experience of a rate of change. But this representation also has its drawbacks. It is clearly cumbersome and not efficient. I think of them all as connected to making predictions about data – certain representations lend themselves to different ways in which data is presented, and certain representations help make predictions about that data. Tables are great when you need to generate data from a scenario – you have a situation that has been given to you and you need a place to start. Creating a table for some initial data helps you see the patterns in whats happening and helps you make littler predictions about where the data is going. If I want students to appreciate tables, I give them a visual pattern or a scenario problem with a starting condition and a rate of change, then ask them some questions about what will happen. Graphs are great when you’re given several random data points that, even when arranged as a table, don’t indicate a clear pattern. Sometimes plotting these visually helps you predict what other points could be missing, or what other points exist as the pattern continues. This is especially true for situations whose solutions depend on two variables, such as only having 30 dollars to spend on item A that costs 2 dollars and item B that costs 1 dollar. 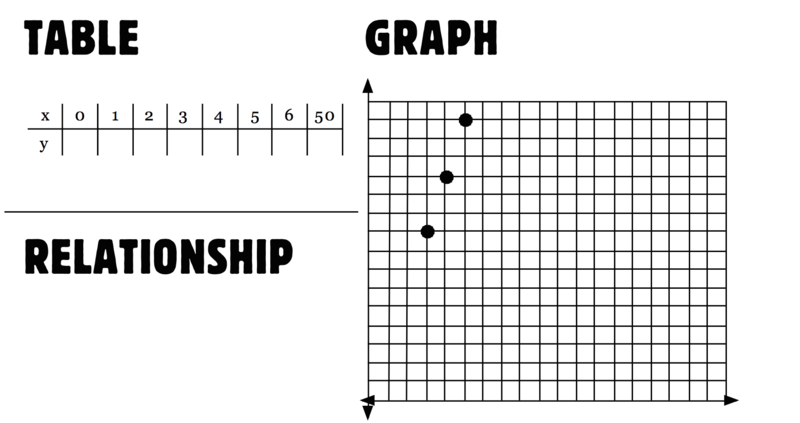 When I want students to appreciate graphs, I give them one of these situations (which usually lends itself to standard form of an equation, but they don’t know that) or I give them several data points and ask them what’s missing in the pattern. This is easier to see when organized visually and you you a particular shape to your points rather than a random collection. Equations are the most efficient way to make predictions about patterns – if you’re given an equation, there’s no reason to have any other representation. Equations are useful for predicting far into the future for your data – maybe you can figure out the first few terms of your pattern, but trying to generate the 100th term is inefficient. Using an equation is like being omnipotent with a set of data. When I want students to appreciate equations, I give them a scenario but ask for a data point in the absurd future where the table or graph necessary to find the point would be too large and unwieldy to use. The order I’ve presented these in this comment is also my typical order for presenting these representations to students: tables are useful at the beginning to generate data; graphs are useful once you have lots of it that may or may not be organized and may be missing some points, and equations are good for predicting the future. A curious consequence might be: it’s not particular situations that necessitate one representation versus the other; rather, its what data you choose to give them at the beginning and what you ask them to do with it that makes one representation more valuable than another. So very true. This skill seems to be neglected in our classrooms. Computers can take one representation and switch to others over and over again, much faster than humans can. If switching back and forth is your only skill, I can easily replace you with a $100 calculator from Target. And the calculator will be faster and more accurate. But if I’m training students to be problem solvers who are smarter than computers, the “which representation is needed here” is a much more important question. I’m not aware of a computer that can answer that question. 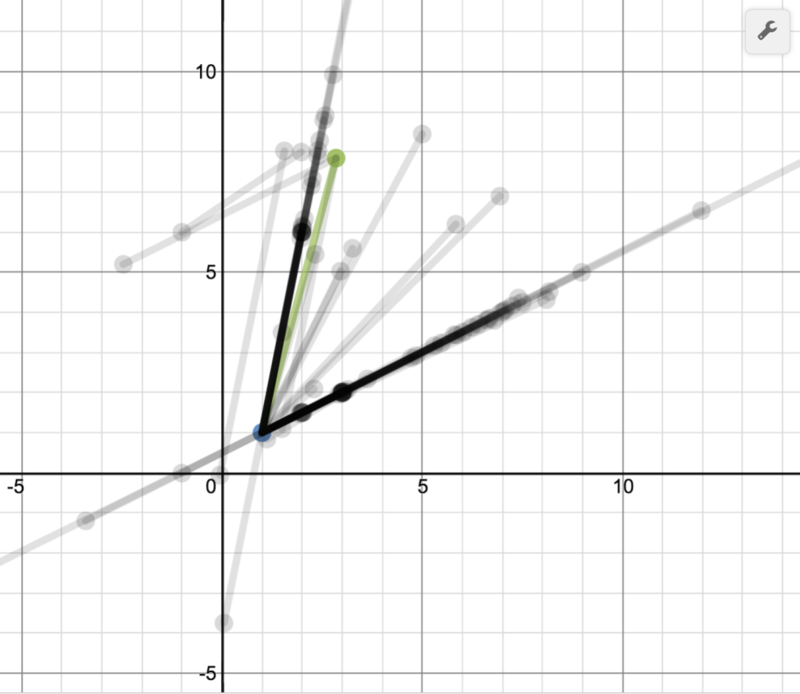 Draw a simple line on a graph. Now what is the value at x = 1.37? Now they see that the equation is quicker and more accurate than the graph — even when inside the graphed region. Or draw two lines that do not meet at integer values. Where do they meet, exactly? Hence that simultaneous equations are better in some situations than graphs. 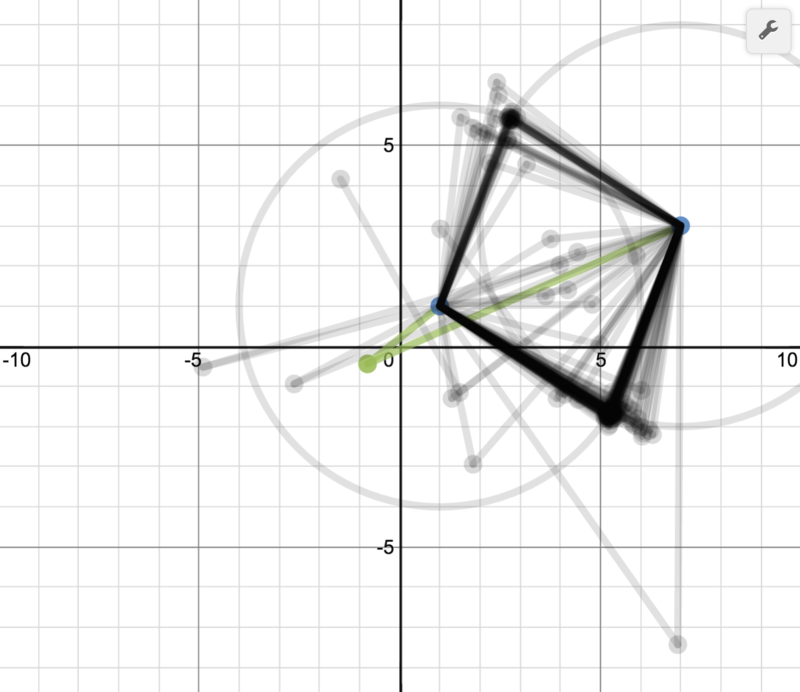 But again, we can draw y = log x crossing y = x2 quicker on our graphics calculator than we can solve it. BTW: Essential reading from Bridget Dunbar also: Effective v.Efficient. Let me wrap up this summer’s series by offering some time at the microphone to two groups of critics. You can’t be in the business of creating headaches and offering the aspirin. That’s a conflict of interest and a moral hazard, claims Maya Quinn, one of the most interesting commenters to stop by my blog this summer. You can choose one or the other but choosing both seems a bit like a fireman starting fires just to give the fire department something to do. But “creating headaches” was perhaps always a misnomer because the headaches exist whether or not we create them. New mathematical techniques were developed to resolve the limitations of old ones. Putting students in the way of those limitations, even briefly, results in those headaches. The teacher’s job isn’t to create the headaches, exactly, but to make sure students don’t miss them. To briefly review, those headaches serve two purposes. Two, by tying our lessons to those five headaches we create several strong schemas for new learning. For example, many skills of secondary math were developed for the sake of efficiency in computation and communication. That is a theme that can be emphasized and strengthened by repeatedly putting students in a position to experience inefficiency, however briefly. If we instead begin every day by simply stating the new skill we intend to teach students, we will create lots and lots of weak schemas. So creating these headaches is both useful for motivation and useful for learning. Which brings me to my other critics. There is a particular crowd on the internet who think the problem of motivation is overblown and my solutions are incorrect. Some of them would like to dismiss concerns of motivation altogether. They are visibly and oddly celebratory when PISA revealed that students in many high-performing countries don’t look forward to their math lessons. They hypothesize that learning and motivation trade against each other, that we can choose one or the other but not both. Others even suggest that motivation accelerates inequity. They argue that we shouldn’t motivate students because their professors in college won’t be motivating. But there are also those who do care about motivation. They just think my solutions are overcomplicated and wrong. They have a competing theory that I don’t understand at all: just get students good at math. It’s that easy, they say, and anybody who tells you it’s any harder is selling something. I see two possibilities here. Either the majority of the nation’s Algebra teachers have never considered the option of simply speaking clearly about mathematics and assigning spiraled practice sets, or they’ve tried that pedagogy (perhaps even twice!) and they and their students have found it wanting. Tell me that first possibility isn’t as crazy as it sounds to me. Tell me there’s another possibility I’m missing. If you can’t, I think we’re dealing with a failure of empathy. Imagine that an alien culture scrambles your brain and abducts you. You wake from your stupor and you’re sitting in a room where the aliens introduce you to their cryptic alphabet and symbology. They tell you the names they have for those symbols and show you lots of different ways to manipulate those symbols and how several symbols can be written more compactly as a single symbol. They ask you questions about all of this and you’re lousy at their manipulations at first but they give you feedback and you eventually understand those symbols and their basic manipulations. You’re competent! I agree that in this situation competence is preferable to incompetence but how is competence preferable to not being abducted in the first place? If that exercise in empathy strikes you as nonsensical or irrelevant then I don’t think you’ve spent enough time with students who have failed math repeatedly and are still required to take it. If you have put in that time and still disagree, then at least we’ve identified the bedrock of our disagreement. But just imagine how well these competing theories of motivation would hold up if math were an elective. Imagine what would happen if every student everywhere could suddenly opt out of their math education. If your theory of motivation suddenly starts to shrink and pale in your imagination, then you were never really thinking about motivation at all. You were thinking about coercion. They Really Get Motivation, Don’t They? They Really Get Motivation, Don’t They, Ctd. True story: it’s possible to fly through your own secondary math education – honor roll bumper sticker on your mom’s minivan and all – but miss some of the Very Big Ideas of secondary math. Another benefit of evaluating both expressions for a set of values is to emphasize the equivalence of both expressions. Students lose the thread that simplifying creates equivalent expressions. All too often the process is seen as a bunch-of-math-steps-that-the-teacher-tells-us-to-do. When asked, “what did those steps accomplish?” blank stares are often seen. Past a certain point, those operations are trivial. But it’s only past a point much farther in the distance that the understanding – these two rational expressions are equivalent – becomes trivial. 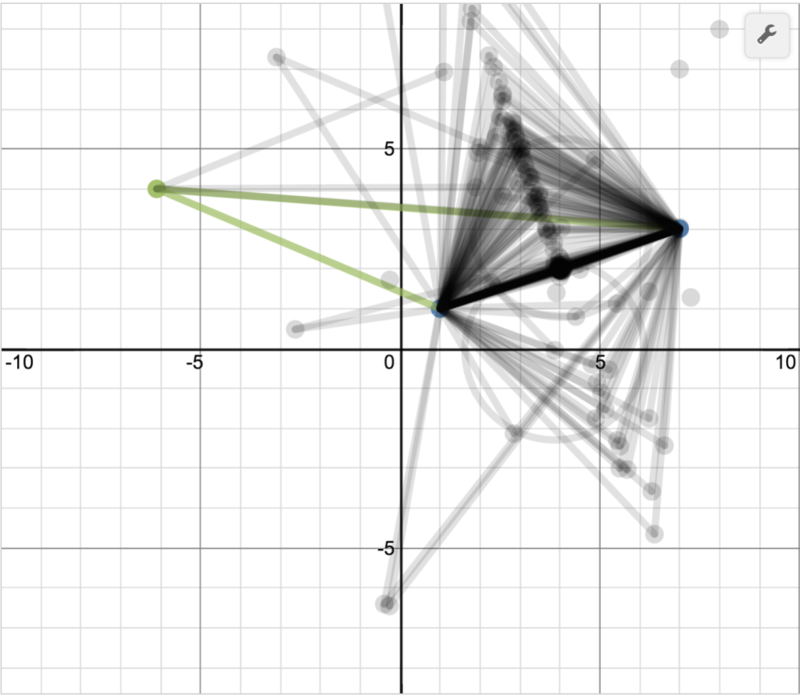 That’s one reason I’m excited about the Desmos Activity Builder and this activity I made in it last week, Loco for Loci! 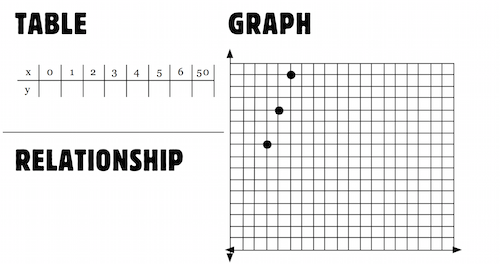 It asks students to place a point anywhere on a graph so that it makes a particular relationship true. 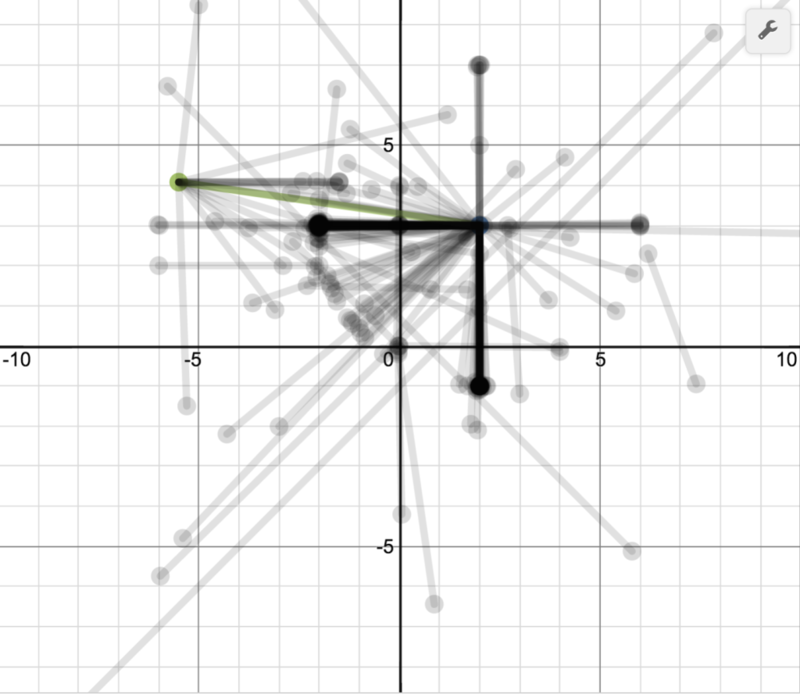 Then it asks the students to imagine what all of our points would look like if we pictured them on the same graph. Then the teacher can show the results, underscoring this Very Big Idea that I didn’t fully appreciate my first time through high school – what we eventually think of as a continuous line is a picture of lots and lots of points. 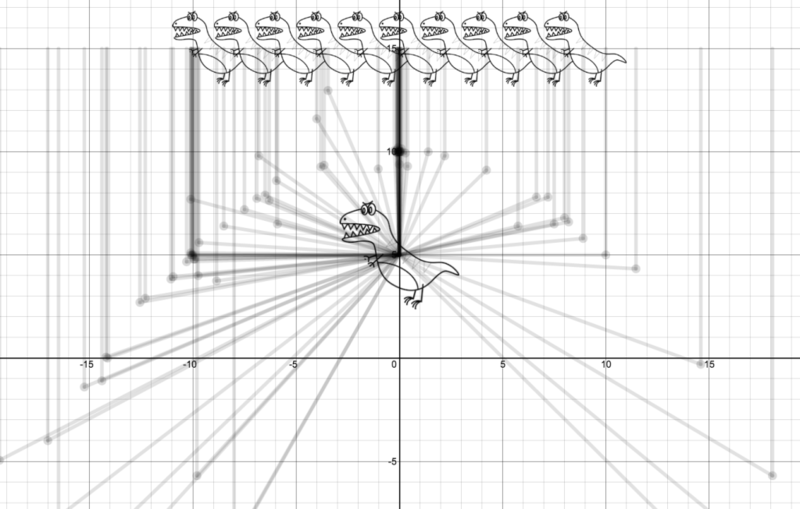 Whimsical: “Drag the green point so it is the same distance from a) the line of dinosaurs and b) the big dinosaur.” I really couldn’t have hoped for better here. And then a couple of very interesting misfires. You could run a semester-long master’s seminar on the misconceptions in that last graph. Maybe more like ten quick seconds at the start of your Algebra class. If you’d like to run this activity with your own students, here is the teacher link. Obviously, I didn’t invite hyperbolas and ellipses to the party. Which other loci should have received the same treatment? Which Very Big Ideas did you only fully understand once you started math teaching? I find this sort of gap fascinating [my inability to conceive of graphs as a picture of solutions –dm] especially because it is likely somewhere along the line you were at least told this fact (you might even be able to track exactly where). But it still didn’t stick! It’s as if being told just isn’t enough. The description you give about graphs is something we have to hit early and often in CME Project, it’s one of the top 3 things to learn in the entire curriculum. It’s amazing how that can get lost in the shuffle, but it does, and where it gets lost is the algorithmic way of graphing a function or equation: the A does this, the B does that, etc — all of this ignores the deeper fact that under the hood, this is all a relationship between two variables x and y.
Variables represent numbers, so test numbers to test ideas and build equations. Rules for new stuff should respect existing rules. Amazing, all the people unburdening themselves on Twitter of math they only understood once they began teaching. What does it all mean? If Simplifying Rational Expressions Is Aspirin Then How Do You Create The Headache? In particular, adding rational expressions with unlike denominators, resulting in symbolic mish-mash of this sort here. So our usual approaches to motivation fail us here. We have to ask ourselves, instead, why anyone would prefer the simplified form to the unsimplified form. If the simplified form is aspirin, then what is the headache? I don’t believe the answer is “elegance” or “beauty” or any of the abstract ideals we often attribute to mathematicians. Talking about “efficiency” gets us closer, but still and again, we’re just talking about motivation here. Let’s ask students to do something. We simplify because it makes life easier. It makes all kinds of operations easier. So students need to experience the relative difficulty of performing even simple operations on the unsimplified rational expression before we help them learn to simplify. So with nothing on the board, ask students to call out three numbers. Put them on the board. And then put up this rational expression. Ask students to evaluate the numbers they chose. It’s like an opener. It’s review. As they’re working, you start writing down the answers on Post-It notes, which you do quickly because you know the simplified form. You place one Post-It note beneath each number the students chose. You’re finished with all three before anybody has finished just one. 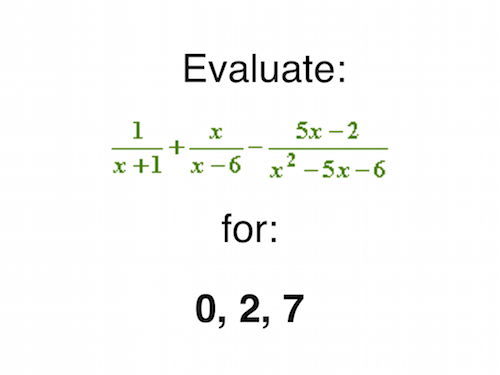 As students reveal their answers and find out that you got your answers more efficiently and with more accuracy than they did, it is likely they’ll experience a headache for which the process of simplification is the aspirin. Again we find that this approach does more than just motivate the simplification process. It makes that process easier. That’s because students are performing the same process of finding common denominators and adding fractions with numbers, they’ll shortly perform with variables. We’ve made the abstract more concrete. Again, I don’t mean to suggest this would be the most interesting lesson ever! I’m suggesting that our usual theories of motivating a skill – link it to the real world, link it to a job, link it to students’ lives – crash hard on this huge patch of Algebra that includes rational expressions. That isn’t to say we shouldn’t teach it. It’s to say we need a stronger theory of motivation, one that draws strength from the development of math itself rather than from a student’s moment-to-moment interests. By a creating a “headache” using a theory of need, we’re really looking back to the situations that prompted the development of the mathematics we intend students to learn. We’re attempting to place students in the position of the mathematician/scientist/logician/philosopher who was originally staring down a particular set of mathematics without a clue about where to go and developing a massive headache from his hours of attempt. I love this idea because it transcends any subject and students learn the value of the learning process. I feel like it’s a mathematical habit of mind. Mathematicians don’t like drudgery either. But what makes them different from a typical American math student is, rather than passively accepting the work as tedious and plowing ahead anyway, they do something about it. They look for a workaround, or another approach. It is elegance, it is beauty, and I’m afraid I simply don’t buy the efficiency argument at all. Missing the Promise of Mathematical Modeling. My Spring 2015 article in Mathematics Teacher analyzes the meager opportunities for modeling in school mathematics and recommends some solutions. The Checkout Line Is A Scam. (Or Is It? [Yes, It Is.]) My blog post illustrating modeling through the lens of grocery express lines, which are a scam. Math Class Needs a Makeover. A 11-minute talk I gave for TEDxNYED in 2010. Couple million views. Fake-World Math: When Mathematical Modeling Goes Wrong and How to Get it Right My TEDxNYED talk + five more years of study + 50 extra minutes. Modeling asks students a) to take the world and turn it into mathematical structures, then b) to operate on those mathematical structures, and then c) to take the results of those operations and turn them back into the world. That entire cycle is some of the most challenging, exhilarating, democratic work your students will ever do in mathematics, requiring the best from all of your students, even the ones who dislike mathematics. If traditional textbooks have failed modeling in any one way, it’s that they perform the first and last acts for students, leaving only the most mathematical, most abstract act behind.